Amanda sent me a package for my birthday. It was my favorite kind of gift: polish! (I'd also accept cash, for the record) It was filled with pinks and more pinks, plus the Butterscotch I fell in love with but couldn't find. I couldn't help but wear two of the pinker pinks together. I loved these two colors. They needed 3 coats on my nails, but I think that was partially my talon-length nails and the overly humid weather. I think I need lipstick to match Sugar 'n Spice. It's a great pink! best picture I could get. 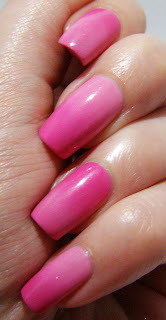 Yay for receiving polish as a gift :D Those two pinks are barbie-like ^^ Love!